For the Cupcakes: Preheat the oven to 350 degrees F. Line a 12-muffin tin with liners or lightly grease pan if not using liners. Set aside. In a large bowl add the sugar and eggs and whisk until pale yellow. Add the coffee, coconut oil, safflower oil and sour cream, mix well. Add the flour, cocoa, baking soda, espresso powder and salt. Mix until incorporated. Fill each muffin cup about three-fourths. Place in the oven and bake for about 18-20 minutes. Remove from the oven and allow to cool completely. For the Mocha Frosting: In the bowl of a kitchen mixer such as a KitchenAid fitted with a paddle attachment, add the butter and confectioners’ sugar and beat until smooth. Add the coffee, cocoa, vanilla extract and espresso powder and mix on medium-high until well incorporated and frosting becomes fluffy and light brown. Spoon the frosting into a large pastry bag fitted with a large plain pastry tip. Pipe frosting on the cooled cupcakes as desired. Repeat with the remaining cupcakes. Place in the refrigerator to set. For the Countdown Clocks: Line a small cutting board with parchment paper and set aside. Using a rolling pin, roll out the fondant until about 1/4-inch thick. Use a small round cookie cutter, juice glass, or paring knife to make 12 round circles. Place on the prepared cutting board. Using your bamboo skewer (or toothpick), dip the pointed tip into the icing color, dabbing off any excess on the side. Carefully write 12, 3, 6 and 9 on the fondant cutouts, as they would appear on an actual clock. You will need to keep dipping your skewer in the icing color as you write. Make two small dots in between each number to represent all the hours on a clock. Next draw small arrows to represent the minute and hour hands, pointing them as you see fit. Place the fondant clocks in the refrigerator to set. 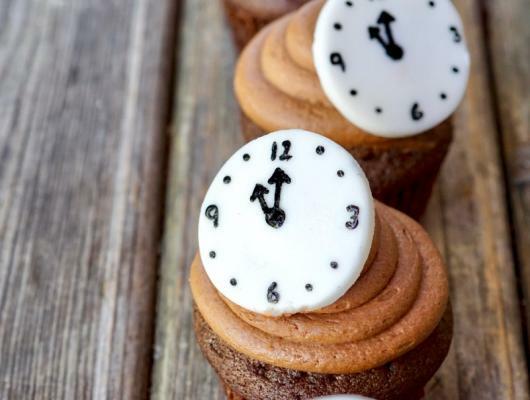 Right before serving, remove the cupcakes and the clocks form the refrigerator. 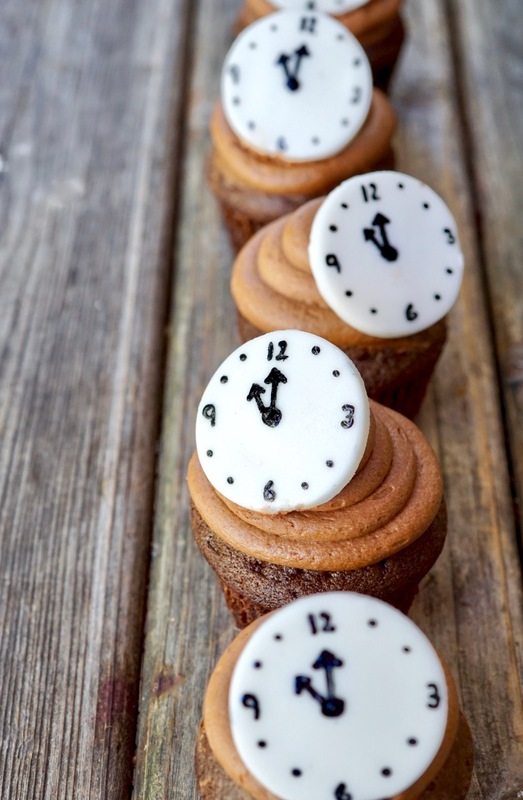 Gently lean one fondant clock on each of the 12 cupcakes.